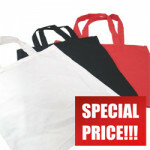 Medium and large side gussett cotton bags, available on special offer for a limited time. All cotton bags are fitted with short loop handles. Printed cotton bags available upon request. Special Offer Large Black Cotton Bags Bag size 400x138x340mm Sold per carton 100 ..
Special Offer Large Blue Cotton Bags Bag size 400x138x340mm Sold per carton 100 b..
Special Offer Large Raspberry Cotton Bags Bag size 400x138x340mm Sold per carton ..
Special Offer Blue Cotton Bags Bag size 355x400mm Sold per carton 200 bags ..